Pt. 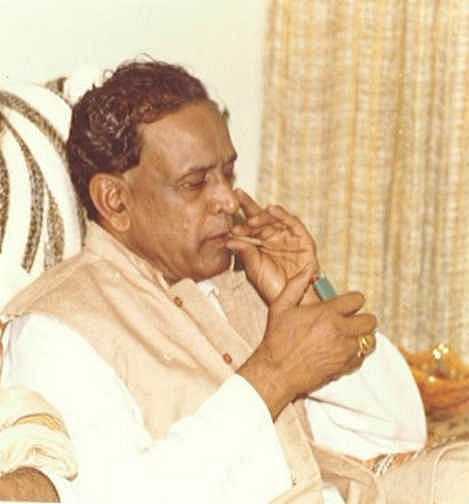 Bhimsen Joshi turns a ripe 80 today. His dedication to music is legendary. As a youth he ran away from home, roaming all over North India in search of a guru, listening and learning from various singers. Finally, Vinayakrao Patwardhan pointed him towards Sawai Gandharva, who lived near Gaddag, in Karnataka, Bhimsenji’s native place. He found his guru, and endured the rigors of talim in the guru-shishya manner. Once he came to Pune and settled here, there was no looking back. He is grateful to this city for the exposure it gave him early on. As he once said at a concert, "If it weren’t for Bharat Gayan Samaj there would’ve been no Bhimsen". Many years ago, after a concert, with admirers crowding around him to shower praise, he said in a deadpan voice, "That's just our daily cry!". On another occasion, at Garware College, he broke for an interval and declared, "Just ten minutes. I want to watch Wimbledon too!" Always ready with a humorous quip. No one will deny that as a resident of Pune he has done his city proud. By coming and settling here, Bhimsenji bestowed on Pune a singer it may not otherwise have produced. So it was only fitting that the University of Pune established the Bhimsen Joshi Chair in his honor at its Centre for Performing Arts in February, 1999. I can't help but reflect on this man's music, and my relationship with it. Till my early teens I was besotted with Hindi film music and Western pop music, including jazz. 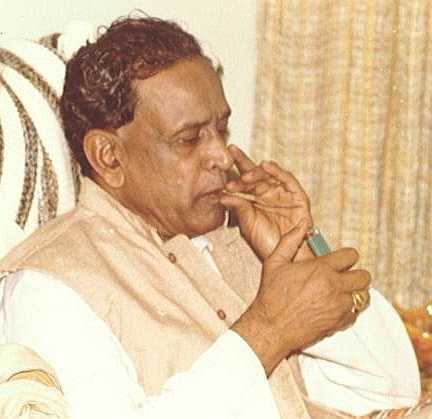 But then three stalwarts, Bade Gulam Ali, Bhimsen Joshi and Ustad Amir Khan, entered my life, and it was changed forever. Along with the music of Western classical composers, I was nourished by their singing during my teen years. It was they who drew me to Indian vocal classical music. I was so moved by Bhimsenji's short rendition of Piya to manat nahi, a thumri in Raag Kafi, that I decided then and there that I would turn to this music and start learning its technique, that I wanted to sing like that. I idolized him. By habit, I committed the entire piece to memory and tried to mimic it. I still know that recording of his Kafi thumri by heart. Another thumri, Nahi Bane Giridhari, in Raag Gara, also had its grip on me during those years, not to mention his masterly and emotion-laden khayals in the Ragas Marubihag and Miya Ki Malhar (HMV releases). Needless to say, his music made a lasting impression on me. Ustad Amir Khan (right). Ustad Amir Khan became Bhimsenji's idol; he'd often pattern his taans after that master, though he'd execute them in his own style. Amir Khan once said that anyone thinking of becoming a mehfil singer should first listen to at least 25 of Bhimsenji’s mehfils. And he gave countless recitals; some estimate that he has given something like 15,000 so far. Even those keeping track must have long since lost count. In a way Bhimsenji repaid Amir Khan’s compliment by insisting that while millions listen to him, he listens to Amir Khan. Khansahib embodied the standard by which he judges himself. As for musical readiness, he maintains that "it is like a Ratnagiri mango which just ripens one fine day". Even after years of learning one cannot predict when it will happen—one simply knows when it does. 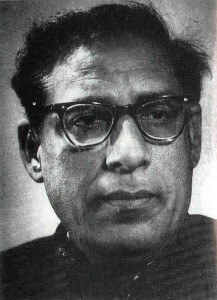 To me Bhimsenji’s place in Hindustani classical music is more than secure, but especially so because of an original contribution: ornaments from Carnatic music like the characteristic andolan, which in a slightly subdued form pervades his singing, giving it a body and sensuality that the North Indian khayal didn’t have before. Other singers who hail from Karnataka have also added their own flavors to khayal, but Bhimsenji’s stands out especially. To my mind his style and temperament really go back to the padas of the Kannada saint-poet, Purandara Das which he sings with great feeling. His playback recordings for some old Kannada films are a delight to listen to. One of my favorite Kannada bhajans, musically speaking, is Yenna paliso karuna kara, and Bhimsenji's rendition is touching. That spirit, those andolans can be heard even in pieces like the drut composition Dhan dhan bhaga suhag tero in his self-composed raag, Kalashree, on a remarkable LP released by HMV in 1971. There are many other examples. Bhimsenji listened carefully to the Agra, Jaipur and Gwalior styles of singing, and incorporated them into the predominantly Kirana style of presentation which he acquired from his guru, Sawai Gandharva. He thus fashioned his own composite gayaki, borrowing from disparate sources. Though he has been influenced by other gharanas, he seemed to me an inspired singer. He was in his prime during the 50’s, 60’s and early 70’s. I’ve listened to some early concert recordings that put him in a class by himself. Bhimsenji raised ‘performance’ to a high art; he was determined to become a ‘performer’ of the first order. He honed the art of mehfil to perfection; his recitals were invariably polished, and his voice almost always in fine fettle, perfectly tuned. He often said that his singing combined the capacious, full-throated alto quality of Kesarbai Kerkar, and the thin, forced, but pitch-perfect voice of Abdul Karim Khan, his guru’s guru. In his heydey his audiences were awed by his virtuosity and sheer stamina; they were kept in thrall for hours, begging for more. But age has caught up with him; those countless sessions have left their mark. Today he is a frail figure. Yet he goes on singing, and performing—that gene courses through his blood. Singing is his dharma, his very life, as his recitals prove year after year at the annual Sawai Gandharva Festival. He needs no words; his music speaks for itself. Though his listeners are bound to have differing opinions about his musicianship, two things stand out: his unqualified devotion to Hindustani classical music, and the distinct Kannada temperament he brought to it. The latter is Bhimsen Joshi’s lasting contribution to our musical culture—a unique southern spirit in a music that came to us from the north. Let's hope that those who will occupy his endowed, and exalted, Chair will pay homage to that spirit.